Many of us who live in towns and cities inclusive of a landfill site are aware of the damage that waste is doing to our environment. In recent years industry regulators have begun to knuckle down on environmental waste to try and curb our disposable lifestyle habits. We know from recent statistics that in 2013, the grocery sector alone produced approximately 6.5 megatonnes of waste, including 1.2 megatonnes of packaging. The solution lies not within replacing food and drink packaging totally, as the need for protective and robust casing will always remain strong, however changes can be made without having to sacrifice quality and wastage. Food manufacturers worldwide are increasingly looking to create aesthetically-pleasing, ecologically-sound packaging that will both appeal to the consumer and protect the environment. Food packaging supplier Sovereign has put forward ten examples that adhere to these ethical guidelines. 1. Modified Atmosphere Packaging is a practice that replaces the normal air inside a package with a special blend of oxygen, carbon dioxide and nitrogen. This compound extends the shelf life of the food. 2. The International Rice Research Institute Super Bag is designed to keep rice fresh for longer. This product reduces oxygen levels inside the pack, cutting the number of live insects inside to fewer than one insect per kg of grain. The outcome sees the germination life of seeds double to 12 months. 3. In some parts of the developing world, such as Cambodia and Laos, waste packaging is used to create new products without processing the materials. The most common example is plastic bags stuffed into empty plastic bottles to become building 'bricks'. Children are paid for collecting empty cans and bottles, with certain supermarket chains paying for returned packaging. 4. The CEO of Quiznos, inspired by the animated film ‘Wall-E’, made it so that greener packaging was used at the restaurant chain. 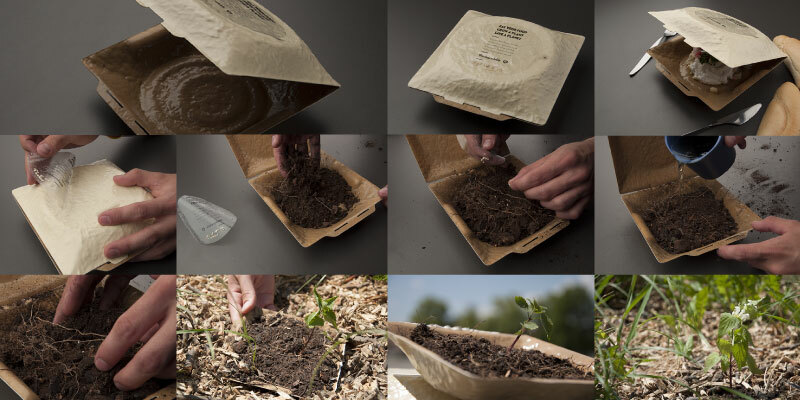 The company now makes use of compostable, renewable, and recycled materials. Furthermore, staff, have been instructed to wear uniforms made of recycled drink bottles. 5. Recycled plastic currently accounts for 50% of their juice bottles. Innocent is a prime example of a company that integrates recycled content into its packaging. The smoothie manufacturer also makes use of sustainable foresting sources for their cardboard packaging. 6. Another material-saving innovation is to squeeze more product into less packaging by increasing the concentration. Robinson's super concentrate Squash’d fruit squash includes this procedure into its packaging strategy. 7. Alternatively, some food brands are packing their products more tightly. Walkers, for example, have reduced the wrapping for their Quavers crisps by 30% just by changing the dimensions of the packet. The new version is said to use less space, which saves on transportation costs and fuel emissions too. 8. Manufacturers MonoSol have created dissolvable wrappers for food. The whole packet can be immersed in liquid, and once dissolved the food and drinks are safe for consumption. MonoSol are developing a further range of edible films that are soluble, biodegradable and can even be flavoured. 9. Edible packaging may sound like a wacky fad, but progress has been made by the WikiCells project to turn this concept into reality. Inspired by the edible skins of fruit, the exterior will be comprised of nuts, fruits, seeds and other ingredients. Drinks, puddings and ice cream all other items selected for trial, with wine casing proposed in the form of a grape-flavoured shell. 10. A designer in Slovakia has created a biodegradable food bowl, which comes with seeds that can be planted in the container after use and will grow into herbs within a week. Not only is this a great way to recycle packaging, it ensures that the consumer has an incentive to reuse the container, and rewards them for doing so. It’s vital that some types of food and drink packaging will need to be modified for the foreseeable future, and its positive to know that the innovations above demonstrate a school of thought that puts a premium on environmental health. With consumers becoming ever more aware of the need for sustainability, it is likely that we will see further such advances in the food packaging sector from suppliers and manufacturers in the near distant future.